This was the third book by Father Michael E. Gaitley that I have read this year, but my introduction to his writing was his piece in the collection Beautiful Mercy. But this book I worked through with a group on facebook. This book is an incredible read. Often when writing reviews of non-fiction books I will draw a few quotes from the book that I highlighted while reading the book. But during my first read through of this book I highlighted 78 passages. 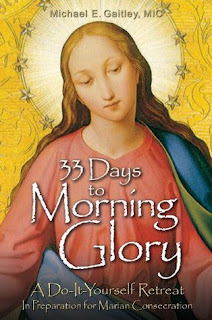 In this book Father Gaitley looks at the history of Marian consecration through three sets of eyes, first through the historical eyes of St. Luis de Montfort, and next those of St. Maximilian Kolbe and finally St. Mother Teresa. Working throught this book either in a group or individually will be an amazing experience. I have heard a lot about Marian consecration over the last few years. But I had also heard that St. Louis de Montfort's method was very complicated. So I had never really looked into it. Then author James Hahn started a group wot work through this book together, and I jumped at the chance to work through this. Father Gaitley does an incredible job of drawing from numerous sources to highlight the meaning behind consecration. He draws extensively from popes and also the three saints that we specifically use as a framework for out teaching. In the introduction Father Gaitley states: "Marian consecration basically means giving Mary our full permission (or as much permission as we can) to complete her motherly task in us, which is to form us into other Christs.". One of the the things I appreciated most about this self-retreat is the prayer. 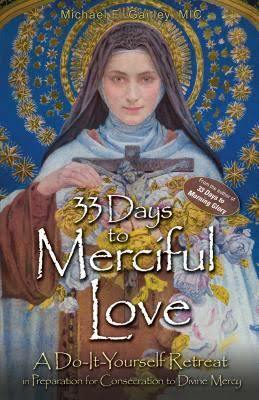 I found that through the daily reading and short prayers each day my own prayer life intensified. I arose early each day to work through that day's chapter, to reflect upon it. I found it often coming back throughout the day. Another quote from Fr. Gaitley that really hit me was "A person practices purity of intention when he directs his thoughts, words, and actions not to himself or another creature but to a divine purpose or mission, and ultimately to God." And really as Christians that should be a goal for all of us. I have always had closeness to Mary our mother, even when away from the Catholic church for a while. This book helped me understand theologically and experientially Mary and her role in my life in a fuller way. Father Gaitley states: "Mary's new motherhood is not some vague or abstract sort of thing. It's concrete and personal. And even though it's universal, it's also intensely particular. Mary is your mother. She is my mother." And she is. And this book will help youi grow in understanding that. This was an incredible read and I highly recommend it and look forward to reading more by Father Gaitley. Great review! Thank you for joining our study and for contributing to its success.